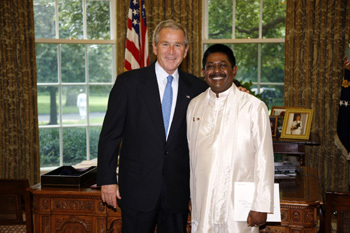 Ambassador Jaliya Wickramasuriya presented his Credentials to U.S. President George W. Bush, at the Oval Office of the White House, on July 28, 2008. During the ceremony, President George W. Bush warmly welcomed Ambassador Wickramasuriya to Washington D.C. and said that he looked forward to deepening the relationship between the two countries. He added that the United States values its friendship with Sri Lanka, noting that the two countries established a trade relationship as early as the 18th Century, and since then, time has seen the expansion of ties between the two countries, in tourism, education, investment, and common interests. Ambassador Wickramasuriya responded with equal warmth and conveyed President Mahinda Rajapaksa’s appreciation of U.S. support to Sri Lanka in its continuing struggle to combat terrorism, especially the pro-active measures taken by the U.S. toward this end. For three decades, Sri Lanka has suffered the social, psychological, physical and economic consequences of terrorism, which has taken the lives of countless innocent civilians, who have become victims of war. The Ambassador commented that the United States and Sri Lanka have shared diplomatic relations spanning over a period of more than 60 years. The two countries have pledged a comprehensive alliance, sharing common values of democracy, rule of law, human rights, human dignity and free trade. President Bush said that the United States looked forward to working with Sri Lanka to advance a common agenda and to deepen the strong and abiding friendship between the two countries. President Bush engaged in friendly conversation with the family of the Ambassador, enhancing the easy informality that followed the formal ceremony.